So today we learn that BO recently broke her neck. How? Well, the Korean Air people decided vai couldn't carry his guitars on the plane. No big deal, they'll go under the plane nice and safe. Oh, but while they're loading it, they just throw all the gear and the guitars protected only by a gig bag into the hard metal cart. How fantastic, so BO broke her neck and how very unfortunate for that. Luckily, it was glued and fixed by the next show, so no worries. But really, I find what Korean Air did was just beyond obnoxious. How can you possibly quantify throwing gear covered in flourescent tape and most likely said VERY FRAGILE on it I to a metal cart? I mean, really? I'm glad they fixed the neck or else I think vai should have sued. Thank god this didn't happen to EVO, or I would have sued myself LOL. Although- its probably WAYHY too hard to sue a Korean air company being Americans lol. Do maybe they just don't use Korean Air anymore. If you go on Vai's FB page you can see the pictures of the broken neck, the fixed neck, and the gear thrown into the cart. They also got a video of the Korean Air workers just throwing the gear I to the cart. I really hope they post that for the world to see. I do write a lot, so it probably seems like a rant lol but it's not, it's just my style of writing lol. Poor BO.... Thank god, Ibanez was available for repair. I guess it'll be just a temporary fix. Maybe there's already a new neck prepaired in LACS. eehh, I'm pretty sure if its alright to keep touring with hell just keep the neck, whatshisface sims did the original neck with the LEDs, so I'm not sure if ibanez would even be able to make a guitar neck just like the one now. ocxcxd wrote: Poor BO.... Thank god, Ibanez was available for repair. I guess it'll be just a temporary fix. Maybe there's already a new neck prepaired in LACS. well, Sims did not MAKE the original neck, he put the leds in, im not sure ibanez would put them in if steve already had to take it to somebody else to do. I guess because BO isnt "special" to the setlist except for building the church (shes not downtuned, or anything that would require a backup) and he has lots of guitars with sustainers, he didn't bring a BO backup like MOJO. 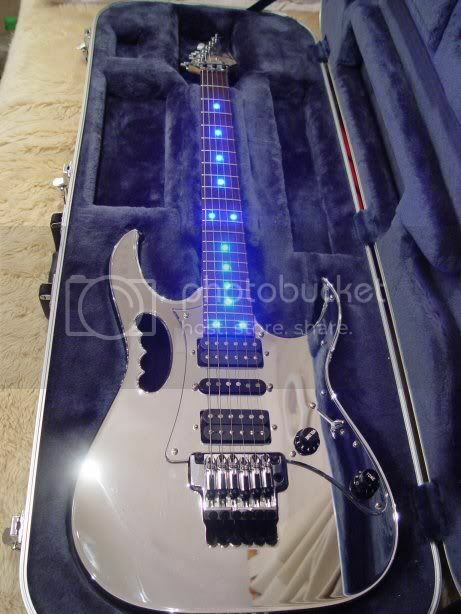 kyle am I wrote: well, Sims did not MAKE the original neck, he put the leds in, im not sure ibanez would put them in if steve already had to take it to somebody else to do. I guess because BO isnt "special" to the setlist except for building the church (shes not downtuned, or anything that would require a backup) and he has lots of guitars with sustainers, he didn't bring a BO backup like MOJO. Bo was a backup for FLO and opposite, but this was before Xavia arrived. I think original neck is from a 7DBK. I have written the whole story about it here. 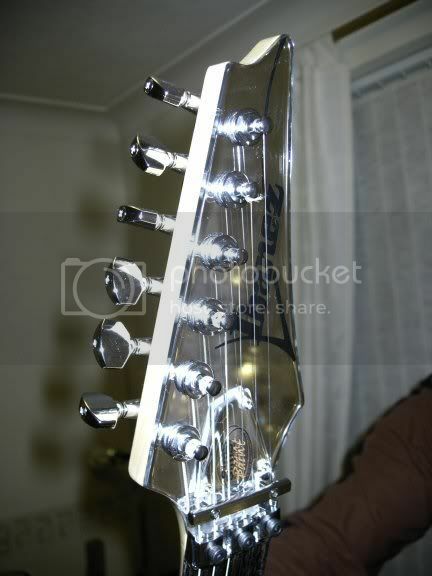 no but Martin sims in the uk who put in the LEDs, making a replacement neck without them would be no problem for ibanez. I didn't know BO was a flo backup (well I figured it for 2007, I still find it odd he only had two sustainer guitars that were both actually used for a different songs and they were a backup for eachother, there wasn't even a true backup). I have a funny video though that wasn't about the Korean Air, but it's funny and I imagine it rings true for the Korean Air. and wow, that's cool, where and what is the on/off mechanism for the LED's? Just one more thing I can't stand about air travel. Bo had a neck replaced. This is the third one. Bo used to have what I believe was the JEM 7DBK neck, that was later modified with LED's by Martin Sims. (And was eventually broken by the airport staff and repaired by Hoshino...) It was a 3pc neck, that had a thick bubinga stripe running in the middle. Now, if you watch SV Rig Rundown by Greg Wurth, you'll see that when Steve grabs BO, no bubinga stripe can be seen there. It has been replaced with a newer 5pc one, made by LACS probably!